Facebook announced several updates to its dynamic ads (formerly dynamic product ads), including the expansion of the ad unit to Instagram, as well as updates to custom audiences for websites. The social network announced Tuesday that dynamic ads are now available on Instagram, and that travel brands can now take advantage of dimensions, location and time specifically tailored for their industry. Facebook added that brands using custom audiences for websites can now better target users who demonstrated “stronger intent,” such as by visiting sites repeatedly or spending long periods of time on those sites. Dynamic ads automate product advertising by showing people ads featuring items they’ve expressed interest in—either by viewing it or adding it to their cart—or items related to ones they’ve shown interest in or purchased. And now businesses using dynamic ads can easily connect with more potential customers on mobile. To date, more than 2.5 billion unique products have been uploaded to Facebook. Now, by extending dynamic ads to Instagram, advertisers can promote relevant products to shoppers who have browsed their website or mobile app across two platforms where people spend much of their time—Facebook and Instagram. While many advertisers already use Instagram to promote their products, manually tailoring ad creative and targeting for every product in their catalog is time-consuming. Now, with dynamic ads, advertisers can showcase every one of their products automatically with dynamic creative and targeting, so they can show the right product to the right person every time. While many advertisers already use Instagram to promote their products, customizing creative with the right targeting for each and every product takes time—but it is important for driving performance. 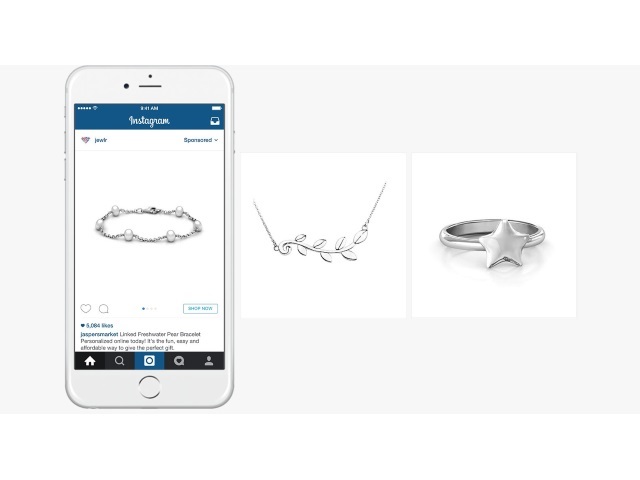 Dynamic ads on Instagram let you promote the right products to the right person at the right time. When someone visits your website or mobile app, and then later looks at Instagram, they’ll be served an ad featuring multiple, related products from ones they were browsing on your site or app. Because of this, dynamic ads are highly relevant for our community—allowing users to explore and engage with the products they care about. And since dynamic ads are always active, they’ll continually reach customers with the right product on Instagram. People come to Instagram to discover things they’re passionate about, and that includes content from businesses. In fact, 60 percent of users learn about products and services on Instagram, and 75 percent say they take action after being inspired by a post. With its bold, mobile format, Instagram is an ideal channel to drive discovery and help shoppers experience your products. Using the carousel ad format, dynamic ads showcase multiple products so consumers can easily browse products in-application. You can create dynamic ads on Instagram the same way you do with dynamic ads on Facebook. To start, upload your entire product catalog into Business Manager. From there, you can buy, manage and report on dynamic ads through Power Editor. You can also work with an Instagram Partner Program company or Facebook Marketing Partner to get started. Once dynamic ads are set up, products will automatically populate based on a person’s action on your website or mobile app. That means there’s no need to configure thousands of individual ads for each product. You can also control the products you want advertised to make sure the ads pull in products that are in stock with their latest pricing. For additional reach, you can even extend your dynamic ads to Facebook and Facebook Audience Network. Dynamic ads for travel empower travel advertisers to offer hotel options to people who have shown interest in taking a trip, either by browsing hotels or searching and purchasing a flight. For example, a travel business can connect with people who viewed a hotel on their website by showing them an ad featuring the hotel they viewed, along with similar hotels in the area. Advertisers can now also help people complete their trips by showing relevant hotels to people who have purchased flights on their website or in their app. And to help advertisers offer people the best experience, the hotel options shown include dynamic availability and pricing, so people always see the most up-to-date information. Dynamic ads for travel are currently in testing with several advertisers. We’ll provide updates when dynamic ads for travel are more widely available across Facebook, Instagram and Facebook Audience Network. Frequency: How many times someone does a certain thing, like visit a page? Time spent: How much time someone spent doing a certain thing, like exploring a website or viewing a specific page. Dynamic date: a range of dates the person has shown interest in, like for a flight or a hotel reservation. Aggregated values: total amount a person has spent. Devices: including Android, iOS devices, desktop and other mobile devices. These advanced behavior criteria enable advertisers to move beyond creating audiences based solely on web page visits and events to being able to segment their audience by the intensity of their interest. Creating audience segments in this way also helps advertisers understand and bid the true value of an action from a person, so they can drive conversions more efficiently across devices. Advertisers: What do you think of the new features announced by Facebook Tuesday?